Meet Logan Randolph - professional mountaineering guide, ski patroller and outdoor certification guru. The last part may seem a little out of place. After years of working outdoors, Logan (and his partner Sam Aarons) founded CertHero.org the first centralized site for finding outdoor courses and certifications. It's pretty awesome. 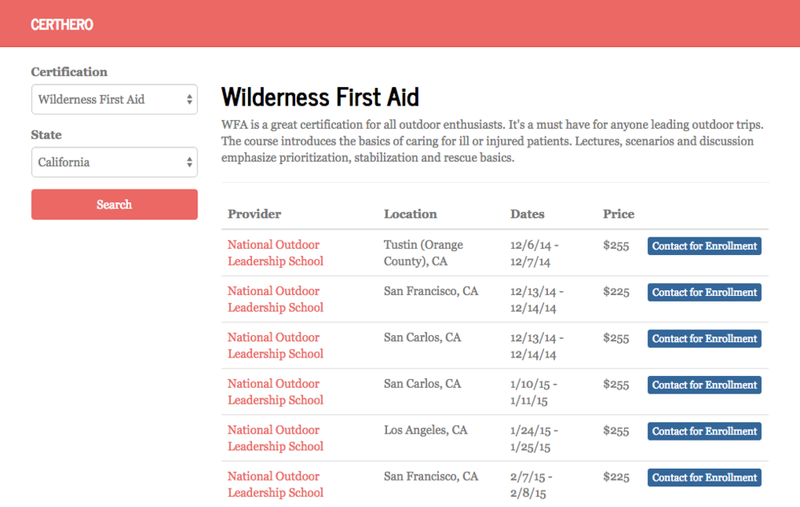 CertHero solves a problem that I've faced and many of you probably have as well - signing up for wilderness first aid and other outdoor certifications can be frustrating and unnecessarily complicated. First of all, whether you are a serious or purely recreational outdoorsmen I recommend looking into getting certified and taking courses. Courses in wilderness medicine are a great way to meet new people and prepare yourself for unexpected emergencies. They're also a lot of fun - most involve outdoor disaster scenarios complete with fake injuries and fake blood and bones. Signing up for classes can often entail searching dozens of separate websites trying to find the appropriate dates, locations and certifications. CertHero aggregates courses from NOLS, SOLO, Wild Med, and most other outdoor educators. You can easily browse courses (from all providers) in one place. You can even sort by location or type of certification and book the course right from the CertHero website. Beyond that, CertHero offers detailed information on these courses. Check out the website CertHero.org and Logan's latest blog post on course selection.